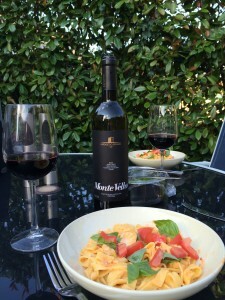 We tried Paul Ainsworth’s Chilli chicken pasta with red pesto sauce from the Great British Chefs website. Chicken breast strips are cooked with a sauce containing onion, garlic purée, vegetable stock, sweet chilli sauce, red pesto, crème fraîche, basil, tomatoes and seasoning. The mixture is served over fresh pasta and we used tagliatelle. We decided on a bottle of Esporao Monte Velho Tinto Alentejano 2013, a Portuguese red from the Wine Society. A good wine but a clash with this particular dish. 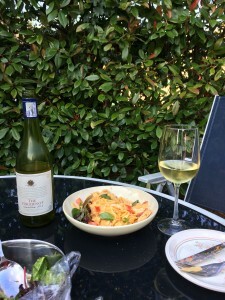 We turned to a bottle of The Huguenot Chenin Blanc 2014, an off-dry South African white from the Sunday Times Wine Club. See here for a previous pairing with this wine. We tasted tropical fruits, especially pineapple and peach, and the finish was slightly citrussy. 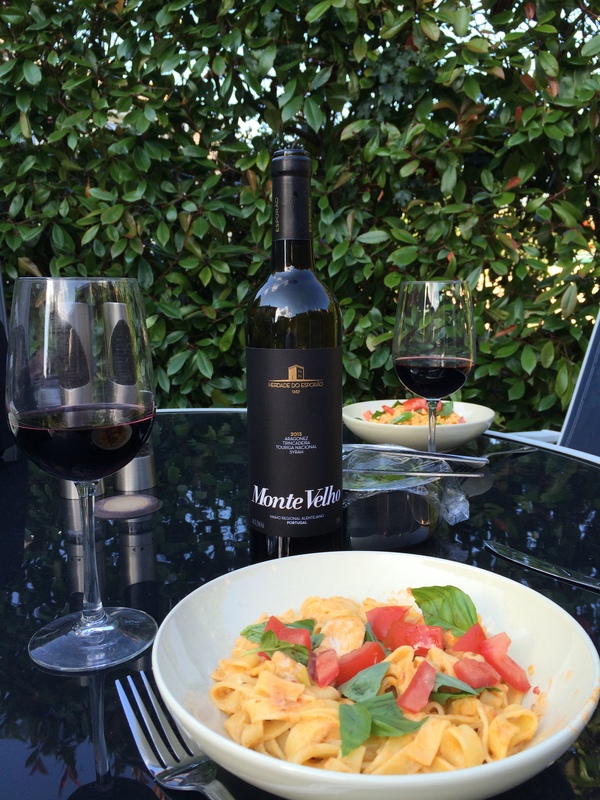 The wine was a very good match with the pasta. We tried Pork Normandy from the Slow Cook Book. Lean pork is cubed and slow cooked with onions, Dijon mustard, garlic, celery, carrots, Rosemary, Bramley apples, dry cider, chicken stock, black peppercorns and double cream. 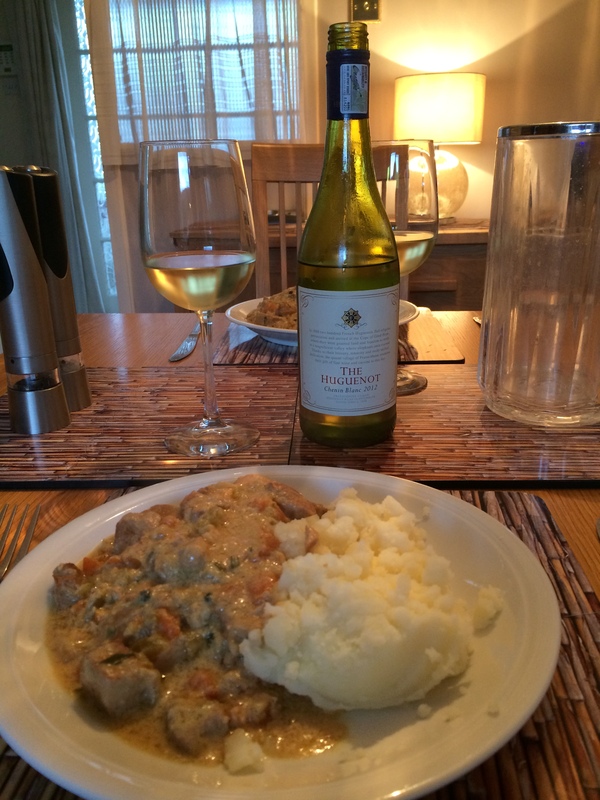 We served this very tasty recipe with mashed potato. To pair with the meal we opened a bottle of The Huguenot Chenin Blanc 2012, a South African white from the Sunday Times Wine Club. We tasted apples, creamy tropical fruits, a slight sweetness and a zesty finish. 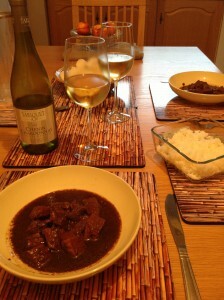 We thought the wine was a very good match with the pork. We tried Slow-cooked pork with ginger, chilli and sweet soy sauce (Babi Kecap) from Rick Stein’s Far Eastern Odyssey. This is braised cubed pork that combines hot, sour and sweet flavours from chilli, tamarind and palm sugar. It includes kecap manis, the thick and sweet Indonesian soy sauce. We served this tasty recipe with jasmine rice, rice noodles and a sambal. In view of the various flavours in the dish we thought finding a good wine pairing might be a challenge. 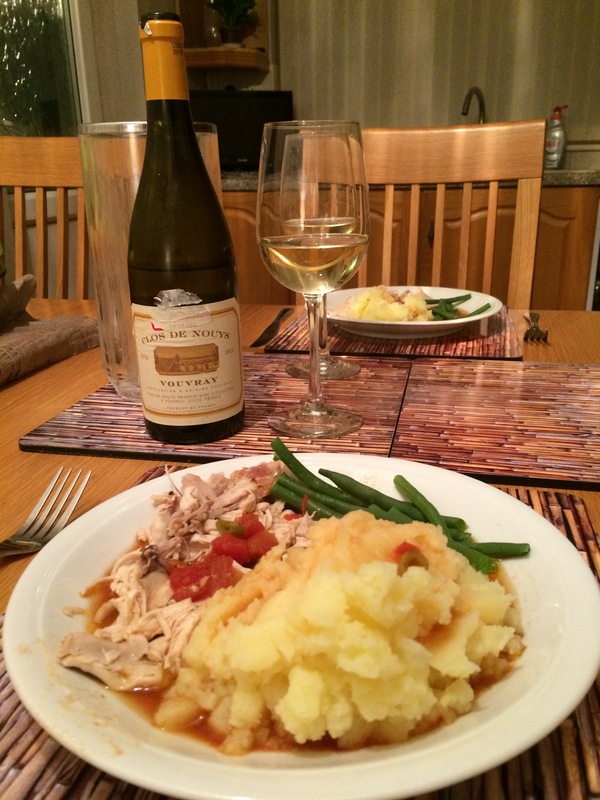 We opened a bottle of Domaine de Tariquet Chenin Chardonnay Côtes de Gascogne 2011 from the Wine Society. The wine combined Chenin zestiness, minerality, mixing with tropical fruits and melon, with a rich, smooth, creamy finish. Complex, with sweet and savoury flavours. Recommended for “exotic” cuisine and indeed a very good match with this dish. We were entertaining our daughter and son-in-law and did another recipe from Levi Roots – Puerto Rican Chicken and Rice. This is flavoured with all-purpose seasoning, peppers, garlic, allspice berries, turmeric, chilli, thyme and green olives. We thought white wines would be the answer. Firstly we opened a bottle of L’Esprit de Sauvignon Vin de Pays d’Oc 2010 from the Sunday Times Wine Club. This French white was crisp and zesty with citrus lemon and was alright with the meal, but not particularly exciting. It had tasted better with the Danish Plaice we had on 10th Feb 2012. 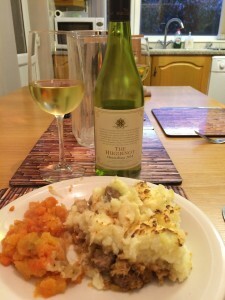 Hannah had brought with her a bottle of Hannu Chenin Blanc a South African white also from the Sunday Times Wine Club. This had apple and peach notes with good acidity and a creaminess on the palate. We all preferred this with the meal. We were invited out to friends for dinner and our hostess served Chicken, Olive and Preserved Lemon Tagine – a recipe from Jamie Does. It was served with couscous and Caesar salad. Our host, Paul, opened a bottle of Namaqua Elephant River Chenin Blanc Chardonnay 2011, a South African white from Morrisons. We tasted melons, peaches and a lemony finish, which chimed in well with the preserved lemons in the Tagine. We all agreed it was a good match and that Paul had chosen well.